The June edition of the Sir Walter St John’s School Magazine brought several updates about Old Boys who were serving with the Armed Forces, and also some obituaries. Updates included congratulations to Harold Eastman for his promotion to 1st Lieutenant with the 2nd Canadian Contingent – although he was wounded in three places a fortnight after his promotion. The Roll of Honour had three names on it, those of James Higgins, Reginald Spring and Frederick Keene, along with some additional information about Harvey Haysom, whose death was reported in the previous magazine. James Higgins had left school in 1910 and gone to work for the Gas Light and Coke Company, joining the 12th London Regiment before the war in April 1914. He was wounded at Zonnibeke in May 1915 and during his convalescence visited the school in July that year, but died of blood poisoning in October 1915 in Calais. Reginald Spring was baldy wounded by a piece of shell in France in May 1916, dying the next day and the magazine says he was buried in the British Cemetery at Noyelles. The lengthiest entry in the roll of honour was for Frederick Keene. He had not actually been with the Armed Forces, although the school felt that he merited inclusion as he had been leader of a troop of Boy Scouts who had volunteered for coastal patrol duty. Throughout the winter of 1914-15, Keene had camped with them and cycled to and from his daily work through all weathers, which led to his health failing and the illness of which he later died. His name was included as having given his life for King and Country “as truly as those who have fallen in the trenches or perished at sea!”. The magazine also features the usual extracts from Old Boys letters, including one from A L Finding, stationed in Egypt “just by the Pyramids”, and referencing being at Gallipoli, another old boy, O D Anderson had also been in Egypt, although was writing having gone from there to Salonika. S T Rogers described having been in a sap which was only 25 yards from the Germans, and occasionally talking to them, including the Germans throwing over a letter from a French prisoner to send to his wife, and two German officers who wanted to know if “any of us had come from Cardiff, as they had been in business there for ten years”. Others seemed more focused on the weather in France, and the negotiations required for billets and food! The February edition of the Sir Walter St Johns School magazine contains several stories relating to the war – including one about a debate on whether or not professional football should still be played whilst there was a war. The overwhelming majority of the vote went against the motion, with only 5 people thinking football should stop, and arguments including that many of the spectators at football matches were dock and arsenal workers who were not allowed to join the Army, and that those in the Forces enjoyed football as well. The magazine lists former pupils who have joined up and the regiments to which they are attached, as well as giving details of the staff who have joined and publishing correspondence from any old boys who have written to the school. Three letters were published in February 1915, one from Lance-Corporal A L Finding of the City of London Yeomanry, who was still in Norfolk, and the other two from old boys in the Queen Victoria Rifles – H Bischiné and J W Mahony. Mahony reports that the regiment have been in the firing line “a number of times; also under shell-fire and I can assure you that is nothing to wish for… On January 5th we were shelled in our billets…Although we are Territorials we are thought a lot of by the regular regiments in our Brigade, and have been complimented by the Officer commanding the Division, several times. We have just done 72 hours in the trenches, without relief, sometimes waist-deep in water, and how have 6 days rest”. Harold George Alois Bischiné was born in March 1898, his father was from the Alsace region of Germany and became a naturalised citizen when Harold was 3 months old. His service record is one of the ones which survived the damage of the Second World War, and it shows that he joined the Territorial Forces in December 1913, when he was 15 years old. On the form, he writes that he is an articled pupil with Messrs Harris and Cullow and that he is 18 years and 6 months of age – clearly a lie. The medical inspection record has a section for “apparent age” where the medical officer has written “17”, although it is clear they didn’t look too closely into his age. He was not discharged from the Territorial Forces until November 1917, when he was commissioned in the London Regiment, having spent from November 1914 to June 1916 in France, then on home duties from 1916 to the date of his commission. At no point does his Army Service record reveal that he was under 18 for almost the whole of his service in France. Bischiné served through the whole of the war, married in 1921 and emigrated to Canada, working in the Civil Service in Quebec. His army service record, marriage index entry and appearance in passenger lists from the 1950s are all available via Ancestry, meaning it’s possible to find out what happened to him after the war – not always a straightforward task. However, if it weren’t for his letter to his school magazine it would look like a mismatch of dates somewhere – the magazine makes it clear he was there under-age and with the knowledge of his superiors. November saw the publication of the first edition of Sir Walter St John’s school magazine since the outbreak of war. Much of the magazine included the usual reports of passed exams and cricket matches, but a member of Form IVA had been in Paris at the outbreak of war and wrote it up for the magazine. The outbreak of war had not been the immediate signal for him to return home and, with the exception of a difficult journey, his experiences were rather uneventful – especially in comparison to Wandsworth residents who were in Switzerland when war broke out (see this post). 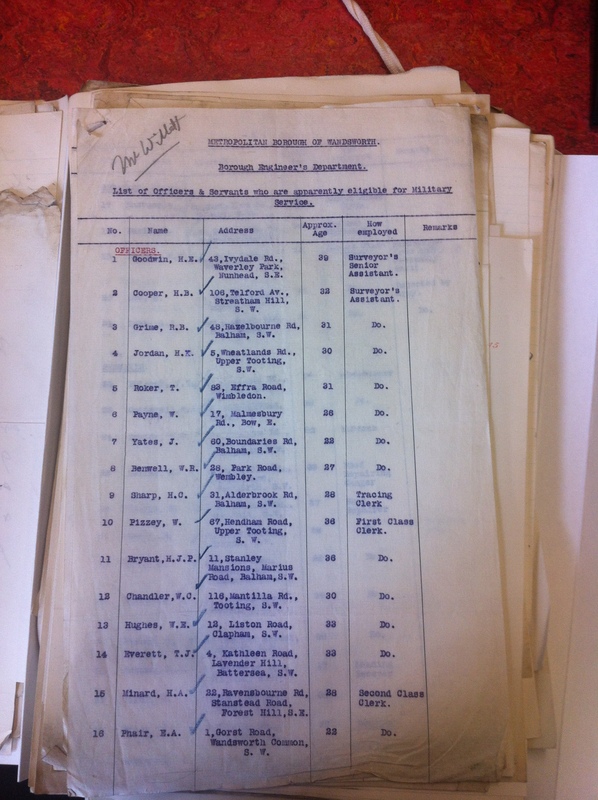 The magazine also features lists of old boys and staff who had already joined up and were on active service. Like their sister institution, Battersea Grammar School, a number of them were with the local territorial 23rd County of London regiment, who were based on St Johns Hill, so had perhaps gone from being in the school cadet force to the TA. The school rifle range was being made available for members of the Old Boys Association on Saturday afternoons from November 7th – although they were expected to bring their own ammunition. Quite how many rifle ranges existed in the borough at the time is difficult to establish, Sinjuns clearly had one and there were at least three in Wandsworth (for more on rifle ranges see here). Four members of staff had been called up for service. Gymnasium instructor W S Broadbent had gone to the 4th London Infantry Brigade and been temporarily replaced by a Sergeant Williams, and A R McIvor had received a Captain’s Commission in the 9th Battalion, Royal Sussex Regiment and been replaced by H Cooper. Caretaker William Lewis was a Petty Officer, 1st class, on board the HM Trawler Bellona, which was on mine-sweeping duty in the North Sea. An edited version of the letter appears in the magazine, describing his work and the hazards at sea – which include one of the crew capsizing ink all over the table and a lamp nearly setting fire to the cabin, let alone the mines they were responsible for clearing. Finally, for anyone considering attending a fireworks display this week, you wouldn’t have been able to do that in 1914 – the headmaster refers to “darkened streets and forbidden fireworks”. 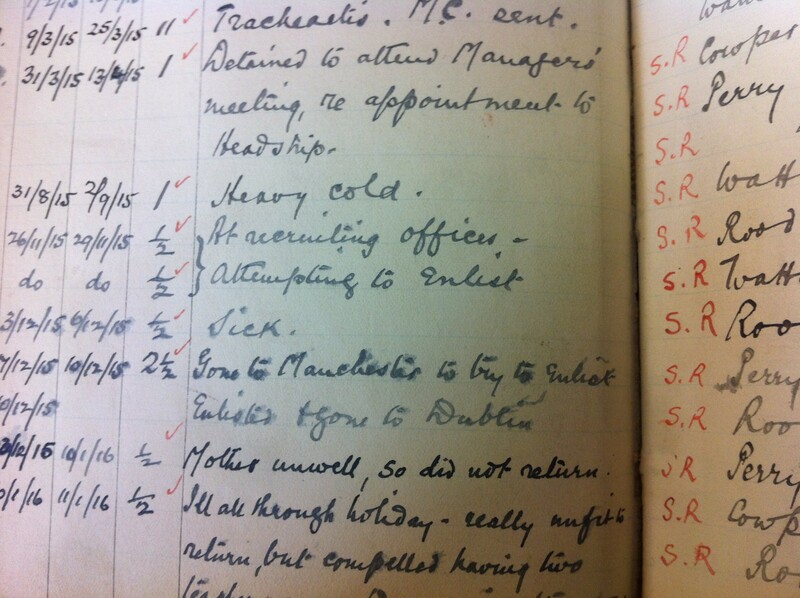 Amongst other details about the life of the school, log books list the absences of teachers for any reason. 23rd October 1914 saw D J Davies, assistant master, called up to join the London Welsh Regiment. 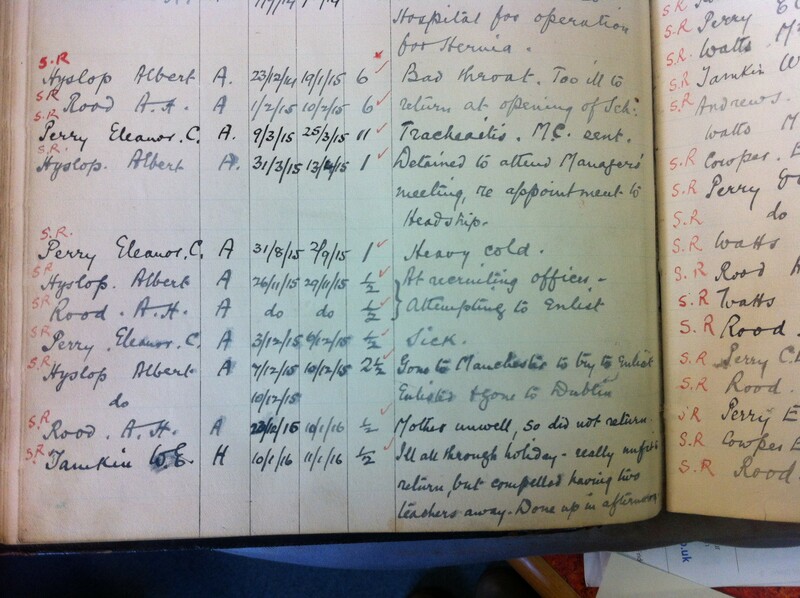 Other war related absences in the log book for Holy Trinity School, Upper Tooting, includes the absence of B C Moore on the outbreak of the war, as he was detained in Switzerland and on 1st September the log book records the absence of T Moody, who had gone to Malta with his Territorial Company. Sadly he never returned to his post at Holy Trinity, as he was killed in July 1916 – he is commemorated on the Thiepval Memorial. 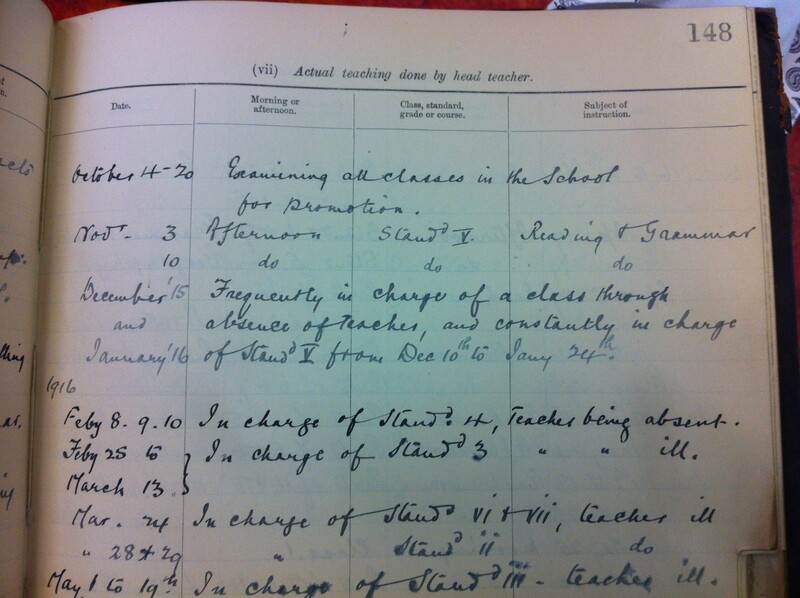 Two temporary teachers had to be brought in, Annie Elizabeth Nelson had been there for a month by this week – she started on 19th September, presumably to cover Mr Moody – and on 23rd November Maud Alice McNeil joined the school to fill Davies’ post. Both these teachers were married, and it had been usual for women teachers to give up work on getting married so it may have been the war having an impact on the availability of male teachers that meant they got the posts. Davies had been at the school since 1910 and returned to work in February 1919. After he returned the next absence recorded for him is a day “attending King’s investiture to get his Military Cross” in June 1920, a distinction that had earned the whole school a holiday on 12 July 1918 when they heard about it. As he was a David J Davies it is difficult to precisely pin down his war record. There were two David Davies gazetted with a Military Cross for conspicuous gallantry and devotion to duty at the same time in 1918. One was a Lieutenant David Davies of the London Regiment, and the other was a temporary 2nd Lieutenant with the Royal Welsh Fusiliers, either of whom could be the same David Davies who taught in Upper Tooting. This was only one small entry in the records for this week in Wandsworth, but the results show the impact the war could have on the borough – more women in work, and occasional celebratory moments even during the war. The London Gazette can be searched online. 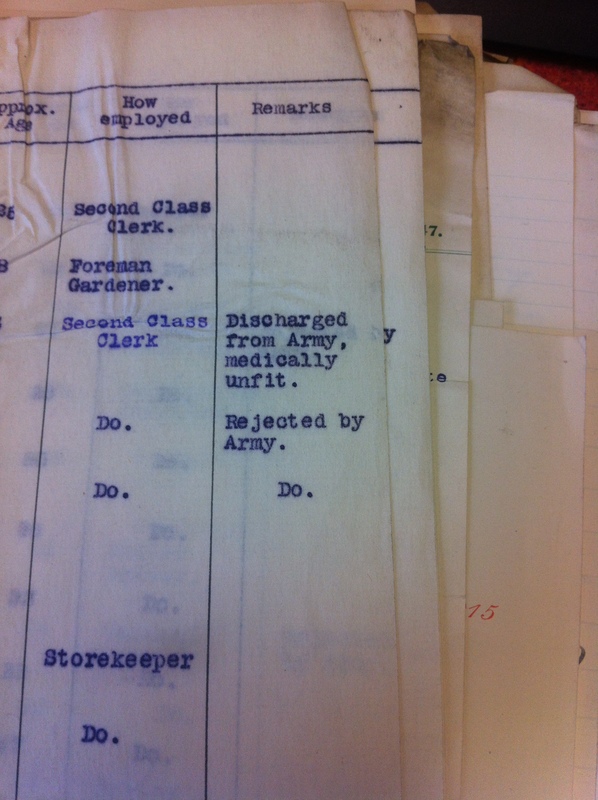 For more advice about finding out about soldiers awarded medals read The National Archives guide.